I've written a couple of times now about my plans for 'doing something' with Lile and Sábha's long-neglected bedroom. At first I just planned to get bunk beds for their room to free up some much-needed floor space. Then, Sábha threw a spanner in the works by announcing that she wanted a room of her very own. I've been dawdling mulling over how to proceed for ages now. (The slow progress of the title is a massive understatement!) I even briefly considered turning their toy cupboard into a closet-office for myself so that Sábha could take my current space. I thought that might just be the best solution - a cosy space for me to write/make and some breathing room for the girls. I even went so far as to start culling and reorganising my craft stash... But then I sat in said cupboard for a couple of minutes... and it felt so horribly claustrophobic I knew it would never work. If the closet looked like this I'd have been happy! 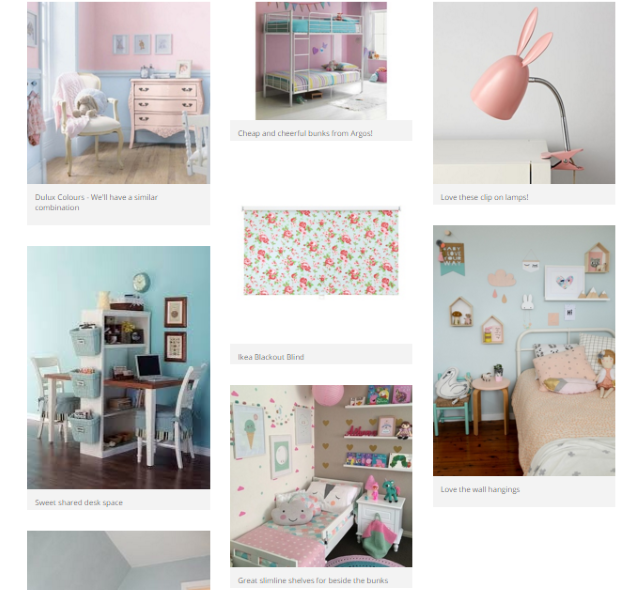 So, I've been trawling the internet looking at other kids rooms and trying to come up with some clever ideas for using all of the space to its full potential. I'm watching episodes of Tiny House Nation for inspiration and obsessing over the 'tiny house movement' in general - watching YouTube videos made by people who live in really, really small spaces. I've also got a Pinterest board on the go - but I've just been pinning stuff randomly and I realise that if we're ever to actually do anything, I'd want to start making some decisions! I set about making a mood-board to try and pull all of my ideas together. I've never made a mood board before (other than on pinterest, I guess) but I've found it's really helped me to focus on what we need. Everything is based on the paint colours we bought ages ago when we first decided their room needed an update. I'm not sure how in-love I am with them anymore but Lile and Sábha helped choose them and still like them, so that's a good enough reason to go ahead and use them as a 'theme'. I want the room design to last them until they're hitting their teenage years (and decide they want to paint everything black or something...) so I'm not basing anything on their current favourite characters or interests. I just want a fresh, clean, practical space that's also a bit pretty and that won't look dated in six months time. I think my biggest challenge will be sorting out their toy hoard (their recent birthday has added immeasurably to it!) and replacing their over-sized chest of drawers for something more streamlined. I know I'll be doodling room layouts and measuring everything 500 times for a while yet - but really, it's high time I got started! Disclosure: This post was written in collaboration with homify. All content was written by me, however. Thank you for supporting the brands that support Where Wishes Come From. It may feel like slow progress, but you make very pretty Pinterest boards and blog posts in the meantime! !